It saddens me to write this, but unfortunately I’ve been reminded lately that my blog is in the public domain and accessible by anyone and its content can be used against me. From hereon in ‘I’ and ‘MY’ shall be used to represent the author of this blog. My identity is and shall remain anonymous. My right to anonymity should be respected at all times and also that of my family. Breaches of this anonymity could put my children’s lives and emotional well-being at risk, therefore I ask that you consider my children’s safety before making any comments or passing on any details that would link myself, my location and/or my family with this blog. The information provided in this blog is based on my own personal views, opinions, thoughts and feelings, I do not represent any other persons or organisation. I have never received any payment for anything contained within this blog. Content Validity – This blog is always in transition. Its accuracy might change over days, weeks or months. I am make no warranties or guarantees of any kind. Please do not strictly rely on the information enclosed herein as any kind of final authority. Content Accuracy – I will en-devour to be as accurate as possible with all that I write. However given that a lot of what I write is based on my own interpretation of my child or children’s feelings, well being and spoken words, this may not always be the case. If there is information contained within the blog that is not accurate for one reason or another I am not to be held responsible for any outcome that results from using any information contained in this blog. External Links – Occasionally I include links to other web sites. I am in no way responsible for what is at the other end of that link. I do not intentionally post offensive links but consideration needs to be given that web sites do change hands over time, therefore I cannot be held liable for the content of that link. Photographs and Graphic Images – With the exception of the photos that I personally have taken, the rest of the photographic content is not mine. I claim no ownership of those photos and images. Libel & Defamation – No persons or organisation will be held liable for any content within this blog. This blog is completely my own opinion and not intended to malign any persons, country, religion, ethnic group, club, organisation, company. Responsibility – I am solely responsible for the content of this blog. These are my own thoughts, ideas, feelings, and opinions. They in no way, shape or form reflect or represent the view of any past, present or future: employer, organization, relative, religious affiliation or group. Comments – I am not responsible, nor will I be held liable for anything anyone else says on my blog. I also am not responsible for any laws that may be broken, in my country or theirs through their comments, content, implication, or intent. I reserve the right, at any point and time, to remove any comment or content placed on this blog by others with no explanation, reason or warning. 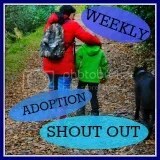 Intent – My intention with this blog is to document our adoption journey and reach out to other adopters. It is not my intention to do harm, injure others defame or libel anyone else. Language Issues – I will not be held responsible for any harm that is caused by any unintentional mis-spelling or bad punctuation that may occur throughout this blog.